It is the sad truth that life can be depressing. Here are some quotes by great authors and other famous persons about selfimmolation and suicidal thoughts. I wanted to die, then. I wanted to destroy the body I was trapped in, become what she was, no matter what it took. No matter how much mutilation or pain. But he looked away, at me. He pulled my face down and pressed my lips against his like he was almost trying to suffocate us both. 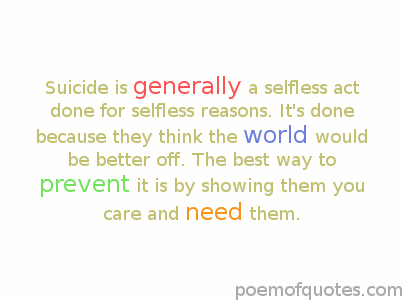 To make yourself something less than you can be - that too is a form of suicide. I came from an extraordinarily dysfunctional family, full of abuse and alcoholism. 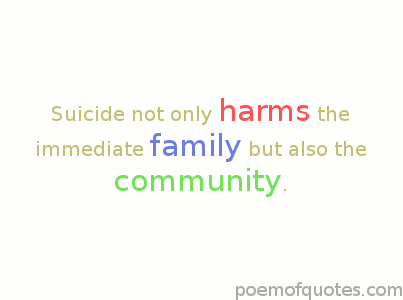 And eventually everyone within the family had committed suicide.